identify different characteristics about lighthouses. identify differences between fiction and non-fiction work. Teacher/librarian may want to visit New England Lighthouses: A Virtual Guide to gain additional knowledge about lighthouses. 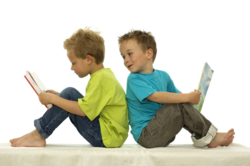 Introduce students to the concept of fiction/non-fiction books. Show students some of Gail Gibbons' books. Include some information about the author. (Gibbons has written over 80 non-fiction books for children.) Tell the students they are going to hear a story about lighthouses. Tell students to listen for facts and be ready to play the trivia game following the reading of the book. Read Beacons of Light by Gail Gibbons to the class. Divide the class into four groups. Tell students that each group will get an equal turn to answer a specific question. Reinforce the rules of the game. 1. No talking when it is not your group's turn. 2. No calling out answers. 3. Before the designated group provides the answer, they must agree with the others in their group on the correct answer and chose one member to give the answer. When a group answers correctly, have the leader come up, choose the answer that has been typed on a card and place it on the poster board. Continue doing this until all groups have had an equal number of turns and the typed answers have all been posted on the poster board. The finished product is a Lighthouse Information Web poster board display! To successfully complete the lesson, the students will have to be able to answer all questions thus completing the poster board web.